Your eyes do not deceive you—that is a two-legged dog walking without assistance. And not only does he walk but he also trots and runs, full-out. It’s amazing. This is Bruce. He belongs to the Lanta Animal Welfare General Manager (Matt) and Marketing/Adoption Coordinator (Lindsay). 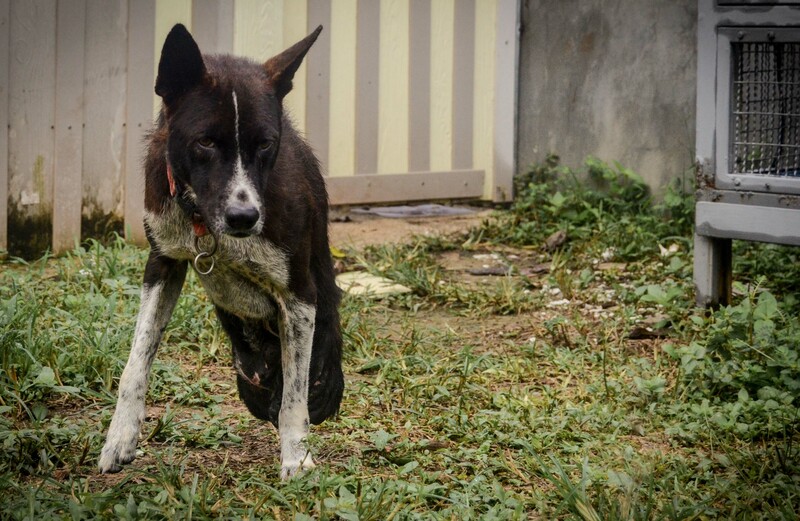 He was found in a plastic bag in Bangkok, both legs broken and unhealable, presumably thrown over a nearby fence. Out of sight, out of mind. Luckily Bruce ended up in Matt and Lindsay’s care and has received proper veterinary supervision and love ever since. He is a testament to the adaptability of dogs, as he became so accustomed to walking upright that he refused to learn to walk with rear-end assistance. He is truly a two legged wonder. I continue to be shocked by what humans are capable of doing to companion animals. It is one thing to dislike something, another to hate it, and something else entirely to go out of your way to inflict pain upon it. Thankfully there are advocates, volunteers, and lobbyists worldwide who are working to help these animals. I am so thankful to have met a number of these people while travelling and hope to make my mark as I head home with a new sense of perspective. The same penalties that apply to someone hurting a human should also apply to animal abusers!